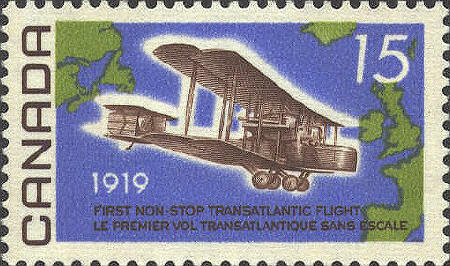 There are several "firsts" in transatlantic air flights. In early May 1919 an American, Albert Cushing Read, led a crew to make the first transatlantic flight in the U.S. Navy flying boat NC-4, from Rockaway, NY to Plymouth, England, with stops in Newfoundland, the Azores, Lisbon, Portugal in 53 hours, 58 minutes. At the end of May 1919 two British flyers, John Alcock, pilot, and Arthur Whitten, navigator, made the first non-stop, transatlantic flight in Vicker Vimy from New foundland to Ireland in 16 hours. They won a £10,000 prize set up by the Daily Mail.